Student groups demanded in November the school take a serious look at several issues concerning race and social justice on campus. ROGERS PARK — Loyola University has announced a plan to deal with the school's "complex" race issues after students demanded the university focus on diversity and acknowledge the "systemic oppression faced by black and brown students in collegiate institutions." 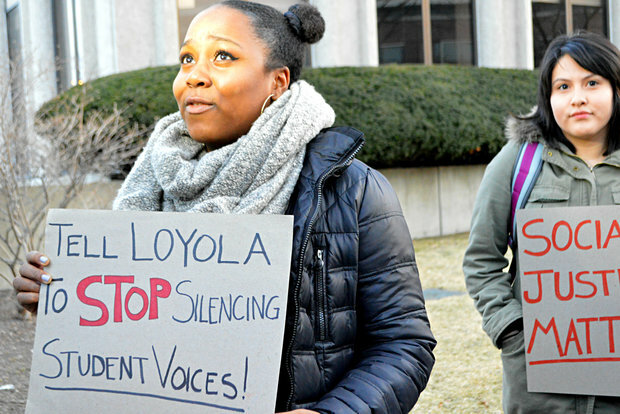 In a statement, interim President John Pelissero outlined what he called “Plan 2020: Building a More Just, Humane, and Sustainable World” — a plan introduced in August 2015 that speaks directly to some of the issues brought up by Loyola Black Voices, a student group that demanded in November the school publicly identify how it would address specific problems it brought to Loyola's administration. "I want to emphasize that these are important issues not just for our African-American student population but for all students of color and all students who identify with a minority group, including first-generation students," Pelissero wrote. In the fall, Loyola students, including groups supporting students of color, gathered in a massive demonstration to show solidarity with protests also happening over race issues at the University of Missouri. Loyola Black Voices made a list of demands at the time, including divesting from "corporations profiting off of human rights abuses in Palestine" by the end of the school year, mandate Loyola Police keep track of ethnicity in incident reports and to make that information public, and to host more recruitment events in Chicago schools where predominantly students of color attend. The group also demanded the black student and faculty populations be doubled, and that the school build a Black Cultural Center. Other items regarding simplifying the financial aid process, bringing back courses geared toward black studies that were shelved, and counting African-American history and literature classes as acceptable core requirement options for undergraduates. Those students said they wanted to hear how the university would address those problems by the year 2020. Four students involved with the protest were later accused of violating the school's demonstration rules, but those allegations were later dropped. Another group of students, Students for Justice in Palestine, who had been rallying alongside Loyola Black Voices, had previously released its own list of demands, which had included calling for all charges against the other students dropped. In addition, Students for Justice also demanded the school's demonstration policy be abolished altogether, portions of which the administration later froze as they continue to revise the policy. Pelissero said he would begin working to implement change, which now includes looking at ways the school's core curriculum can be more inclusive, ensuring places dedicated to minority students remain "safe environments" in which to gather, hiring a company to conduct a "climate survey" to better understand the needs of diverse students and launching a "Diversity and Inclusion" website. The school also created an Executive Council on Diversity and Inclusion "to map out a strategic direction to increase diversity and enhance inclusion" at the college. In his note, Pelissero also said he wanted the university to focus on its recruitment, retention and better financial affordability and availability for African-American students. One way it plans to do that is by offering more merit and grant-based scholarships to increase its ethnic and racial diversity. Pelisserso also said the school plans to hold a "multicultural overnight program" as well as a peer-to-peer program that connect new students with current students of color. According to the most recent data available through the school's Office of Institutional Research, in 2011 382 of 9,856 (or 3.88 percent) undergraduate students identified as black or African-American. "It will be incumbent upon the next University president to continue to address diversity and inclusion issues, and to map out a plan for furthering our institutional progress on all we achieve this semester," Pelissero said. "We know there are no simple solutions to complex problems. ... I view the work ahead as an opportunity — and a responsibility — to create positive change and build community on campus, in Chicago, and beyond."